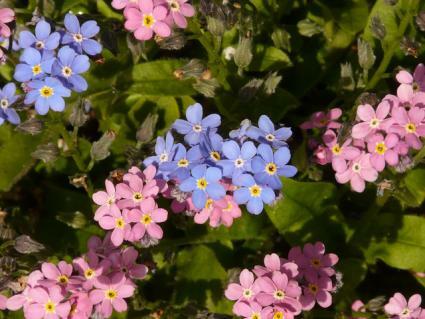 Forget-me-nots are a classic woodland garden plant, forming extensive carpets of their powder blue flowers, seemingly without effort on the part of the gardener. They are a particularly memorable plant, as a cluster of flowers sticks to clothing like Velcro to ensure you don't forget them, hence the name. 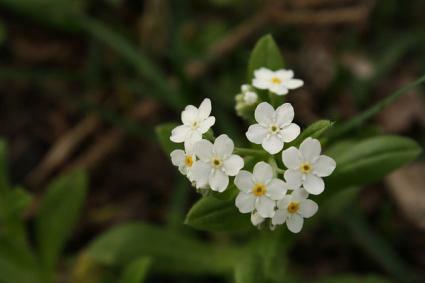 In the right environment, forget-me-nots become naturalized, sowing their own seed and popping up here and there. They are not at all invasive; they can be easily pulled when necessary and don't tend to outcompete other plants, so much as complement them. The flowers are tiny but they make up for their size with quantity. You can plant potted forget-me-nots in spring, but most gardeners opt to establish them by seed in late summer. Simply scatter a packet of seeds loosely over the area where you would like to grow them and walk away - they will germinate on their own during fall and by the following spring they should be in full flower. However, you can't sow them anywhere and expect perfect results. This plant likes cool, moist places with rich soil and partial sun. The edge of a forest is ideal or among widely spaced trees where filtered sunlight can come through. In hot dry places, a little supplementary water and extra shade will help them to grow. They are a low growing groundcover, typically growing to six or eight inches and spreading widely. 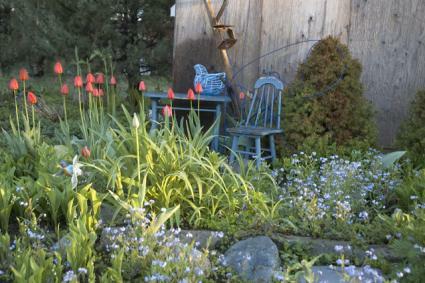 They make excellent companions for taller woodland/part sun perennials, such as ferns, hostas, irises, and most bulbs. They help to soften the base of these plants and are very useful as a cover for early spring bulbs, like narcissus, that look shabby for much of the year. If they're happy, they will spread a little more each year. It's easy to transplant them as needed to keep them from growing where they are unwanted and to fill in areas where you would like to see more of them. They tend to look shabby as fall approaches at which point they can be cut to the ground. If you want them to sow themselves, however, wait to cut them until the seed heads are fully dry and brown; then shake them over the area you want to spread them to make sure all the seeds have come out. Powdery mildew often appears on the leaves late in the year as the plants are going to seed, but it's usually a minor problem and does not affect their growth and flowering in spring. The other common culprit attacking forget-me-nots are slugs, which can be controlled using any number of the commercially available slug baits such as Sluggo. They are more likely to attract beneficial insects to the garden, like ladybugs, than they are pests. Bluesylva has medium blue flowers with yellow centers. Water has extremely light blue flowers. Victoria Indigo has deep, almost electric blue flowers. Victoria Pink has rose-pink flowers. White Ball is a white flowered form. 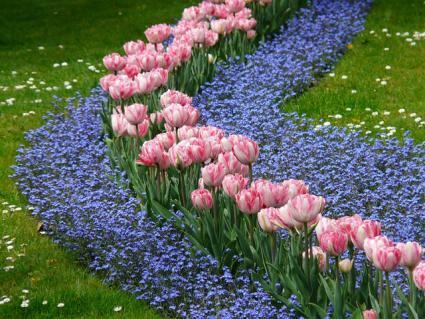 Sylva Mix has a combination of blue, pink, and white flowers with yellow centers. There are myths from around the world involving this diminutive blue flower and besotted lovers, often with tragic endings. Tragedy notwithstanding, forget-me-nots are a traditional flower for lovers to exchange and the sticky blooms make it possible to wear them without a brooch or anything else to clip them into place.